Both social media use and the civic disengagement of college students continue to be on the rise, posing instruction challenges around how and what students are interested in learning in their college classrooms. This project examined the effectiveness of incorporating the use of social media learning—specifically using social media (Twitter) to expose students to a greater depth and breadth of contemporary topic—as a tool of instruction in a political science curriculum. I assessed whether social media learning equipped students with skills that aid them in better engaging in civic dialogue, understanding issues of public policy, and identifying stakeholders on all sides/aspects of an issue. I also examined whether social media usage can enhance student interest in and reduce apprehension regarding engagement with issues of public policy and affairs. My findings indicated students seem to over-estimate their ability to learn about political issues, but the use of social media served to 1) correct this perception, 2) provide a pathway for deeper learning, 3) make learning about an issue more appealing, and 4) engage students who are less interested in a traditional classroom delivery. This assessment of social media learning had three parts. First, and prior to the exercise, I conducted a focus group with the student who would participate. The intent of these questions was to assess the students’ media literacy, interest, and use of social media prior to the exercise. Second, the students were instructed in how to participate in the social media learning exercise. These instructions included preparation for participating in the “Class on Twitter” (COT) session—establishing a Twitter account, following stakeholders, etc., as well as expectations for their participation in the COT. The COT consisted of introducing the students to a trending topic in American politics (e.g. 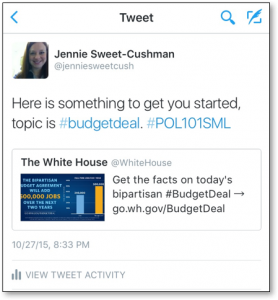 Congress reaching a temporary budget deal) via a brief Tweet that I provided. The students were then expected to use Twitter to learn about the issue from different sources (e.g. stakeholders) and, using a course-specific hashtag, reTweet information other students could learn from and dialogue with other students about. The discussion continued for an hour, with only the occasional prompt from me after the initial Tweet. Questions about process were handled via direct message on the platform. Finally, following the COT exercise, students were expected to prepare a blog using the online blogging application Storify. These blogs were designed to indirectly reveal the students’ substantive learning through the use of social media, but also for them to directly respond to indirect outcomes. In this way, I have both student perception of the exercise and my own. The students participating in this assessment were 21 undergraduate students enrolled in an introductory American government class at a northern urban liberal arts university. The course fulfilled a general education requirement, so students came from a variety of major backgrounds. Five of the students were dual-enrolled high school students, and the remainders were first, second, and third year students. Prior to the social media exercise, I conducted a focus group with the participating students. My intent was to casually assess how interested the students were in political news, how they were getting their political information and discerning its quality, and what role social media played in this process for them. Our discussion yielded two important observations. First, students indicated that they were interested in political topics, but often avoided investigating them because they were “too confusing” and they didn’t have a strategy for gathering quality information. They expressed concern about needing to verify and cross-reference information before accepting it as reliable. Not knowing how to choose a reputable source made this even more daunting, as they were hesitant to rely on most mainstream news sources (primarily cable television outlets) and extremely skeptical of any information coming directly from an elected official or candidate. Interestingly, most seemed accepting of information coming directly from a bureaucratic source (e.g. government agency). Second, while most suggested they rely on the Internet to learn about political topics (e.g. Google, news sites), none offered up social media as a potential source for reliable information. When pressed on whether they could utilize their social media presence for this purpose, most did say they felt social media usage did make them better informed. However, they expressed a significant number of concerns about that process. There were many concerns about the origin of information, the tendency for singular large issues to drown out smaller ones, and the need for verification of facts and sources. The students largely agreed that they felt political information on social media did help raise awareness of issues, but the “noise” provoked by opinions offered little substance for learning. These findings suggest that students may be interested in learning more about political issues and recognize the ability of social media to play a role in that process. However, they lack a skill set that allows that to separate quality information and facts from misleading biased, or inaccurate information that they perceive as making up a significant portion of their exposure. 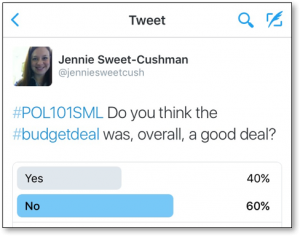 Student assessment and reaction to the exercise was measured using a 1000 word blogpost each student was expected to generate following the exercise that 1) reviewed the details, pros, and cons of the budget deal and 2) discussed the use of Twitter as a mode of learning about the topic. Every blogpost demonstrated student learning on the chosen topic, with nearly all of the students showing an appropriate depth and breadth of knowledge on the topic. There is no such thing as “it’s too long. I didn’t read” or “it’s too complicated. I don’t understand” with Twitter. With the limited 140-character message, Twitter is the perfect platform for people who want to learn about the basic information of something as complicated as politics. If you use the right hashtag and follow the right stakeholders, it is easy to learn about politics and government bills, and what opinions people have about those issues. ..Twitter provides an easy forum to debate the issue with fellow classmates and peers. I was able to discover the opinions’ of elected officials, along with the average American. Seeing my fellow classmates opinions helped me gain perspective on this issue, as well as keep an open mind about the opinions of others. Researching this issue through social media equipped me with a tool to become more informed on future debates and issues. I thought having class on Twitter as a method of researching a current issue was definitely one of the most interesting class experiences I’ve ever had. I loved that it was a true-to-life demonstration on how people in this day and age discover and understand current issues. As an instructor, I was pleased with the depth and breadth of learning demonstrated and students were pleased with the delivery. My observation of the process and assessment of student learning, as well as student perspectives seem to indicate that there is great potential for social media learning as a pedagogical tool in political science and public policy. Four specific findings come out of this exercise. The first two address practical issues of knowledge transfer and life-long learning commitments. The other two address considerations for the utilization of Twitter and other social media platforms as a relevant and quality teaching tool. First, students—prior to the exercise—seemed confident they could appropriately investigate a political issue if they had the time and motivation to weed through the biased and confusing information available to them. However, when required to do so by looking for stakeholders to follow for the COT exercise, very few felt confident in how to approach it and required much guidance in the very basic first step of information gathering. In this instance, then, social media helped correct their perception that they could be easily informed, if only they wanted to be so. Acknowledging that discerning quality sources and information literacy was a bigger hurdle than they had initially assumed, the networked nature of social media provided a pathway for deeper learning. Once a student commits to growing their social media presence in a way that includes sources relevant to politics and public policy. Third, quite simply, students enjoyed learning in their “natural environment”. The average college student is deeply immersed in social media in their personal lives. Using Twitter as a format by which they experience their academic life as well was personal one may mean students feel empowered to learn about political topics that might otherwise seem very removed from their own lives. Prior to this exercise, students reported using (or potentially using) sources to learn about issues that would require very purposeful seeking—cable news or national newspapers—not sources that would be integrated into their typical social media habits. Finally, consistent with Ferriter’s (2010) article highlighting the benefits of incorporating different learning styles into the classroom, I found that the patterns of class participation that existed in the traditional face-to-face classroom delivery method broke down in the COT delivery. That is, students who were very participatory in the classroom were somewhat less so in the Twitter environment. More importantly, in some cases, students who infrequently participated in the classroom were more likely to retweet and comment on Twitter. Social media learning, then, may not only be an effective way to guide students in learning about political and policy information, but also a way to engage a larger (or different) population of students.